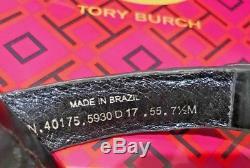 Tory Burch NIB Miller Petroleo Mirror Metallic Blue Logo Sandals US 7.5 Style #40175. Chic alternative to the basic flip flop. Open toe with thong post. 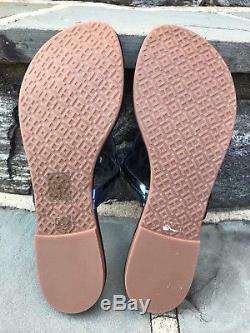 Leather lining with cushioned leather footbed. Stacked 0.3 block heel with non-slip footing. Includes original box and dustcover. Photos are of actual item. Recommended to order a half size larger since they run small. 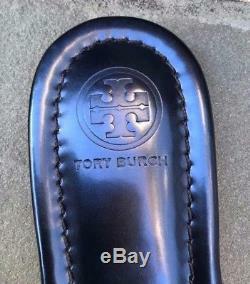 The item "Tory Burch NIB Miller Petroleo Mirror Metallic Blue Sandals US 7.5 M #40175 $198" is in sale since Thursday, January 11, 2018. 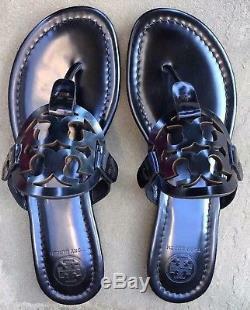 This item is in the category "Clothing, Shoes & Accessories\Women's Shoes\Sandals & Flip Flops". The seller is "authenticity_always" and is located in Pennsylvania. This item can be shipped to United States, Canada, United Kingdom, Denmark, Romania, Slovakia, Bulgaria, Czech republic, Finland, Hungary, Latvia, Lithuania, Malta, Estonia, Australia, Greece, Portugal, Cyprus, Slovenia, Japan, China, Sweden, South Korea, Indonesia, Taiwan, South africa, Thailand, Belgium, France, Hong Kong, Ireland, Netherlands, Poland, Spain, Italy, Germany, Austria, Russian federation, Israel, Mexico, New Zealand, Philippines, Singapore, Switzerland, Norway, Saudi arabia, Ukraine, United arab emirates, Qatar, Kuwait, Bahrain, Croatia, Malaysia, Brazil, Chile, Colombia, Costa rica, Dominican republic, Panama, Trinidad and tobago, Guatemala, El salvador, Honduras, Jamaica, Antigua and barbuda, Aruba, Belize, Dominica, Grenada, Saint kitts and nevis, Saint lucia, Montserrat, Turks and caicos islands, Barbados, Bangladesh, Bermuda, Brunei darussalam, Bolivia, Ecuador, Egypt, French guiana, Guernsey, Gibraltar, Guadeloupe, Iceland, Jersey, Jordan, Cambodia, Cayman islands, Liechtenstein, Sri lanka, Luxembourg, Monaco, Macao, Martinique, Maldives, Nicaragua, Oman, Peru, Pakistan, Paraguay, Reunion.